Their ride continued as they approached the Kingdom of Dwargon. Miki stayed clinched to the boy's backside through the bumps and rumbles along the road, though her own mind wandered as well. 'I don't blame him now for holding on so tight... everything this Ryuuko moves suddenly I feel like I could go flying.' she thought quietly as the landscapes changed around them, her own cloak billowing in the wind behind the mounts movements. 'Still, I don't mind having someone this dependable on my side...' she smirked while maintaining the same grip. She tried not to be a bother to this lad as they traveled in this way but couldn't help but feel comfortable and warm, even while clinging to his back in such a way. 'Keep it together, keep it together...' Kou had resorted to chanting to himself mentally, if only as a coping mechanism for the girl pressed against his back. 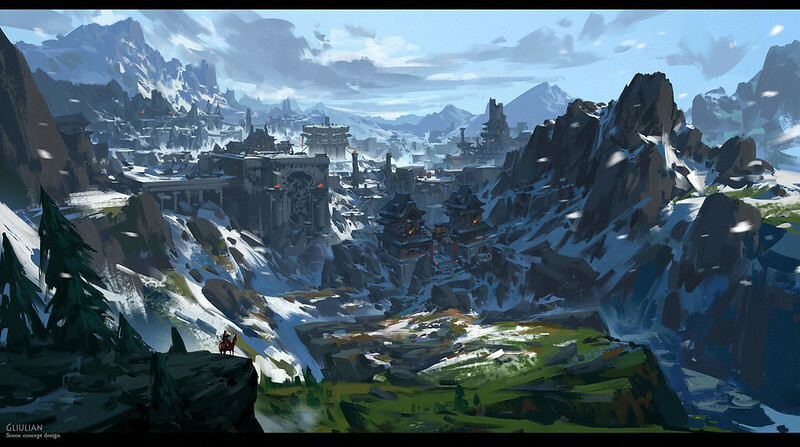 In due time, their mount brought them through the mountain range to the gates of Dwargon, one of the major cities belonging to the Dwarf race. It was an incredible location to behold, covered in snow and surrounded by icy mountains on all sides. The Ryuuko they rode stopped before they reached a line of travelers aiming to enter the city, and the beast beneath them disappeared. Kou was in a decent enough position to land on his feet without issue, but he hadn't banished the creature willingly. "Hm. Must be one of those places that doesn't let you ride a mount in game. I wonder how that worked out here though..."
Whatever discomfort this lad had about their current seating arrangement it would go unnoticed by Miki and would eventually be alliveated as they came across the dwarven city Dwargon. Seeing this massive place, tucked into the icy mountainside was breath-taking. Miki leaned away from the lad for the first time, simply to stare up in wonder. "Sugoi!" she muttered outright. This was of course, right before their mount disappeared from beneath them. It was kind of sudden, but the girl had the reaction speed of her classes on her side and managed to fall into stride soon after her fall without any problem. "Hm, I guess it would make sense if we can't just ride mounts inside a city..." she mused as she took note of the line of travelers headed into the city. "Perhaps they just worked it out so monsters can't enter... I heard there are some high class barriers like that..." she stated without much thought. "Think we should just join the line?" she asked of him seeing as it seemed to the only way inside it wasn't really a question, as they intended to go inside regardless. "Yeah, that would make sense. It'd especially be a problem if we were invaders bringing a leveled Ryuuko in," Kou replied to the girl's assertion. As they approached the line and Miki questioned whether Kou thought they should join it, the male Adventurer gave it some thought. In a few cities within the game, he'd seen lines similar to this one, but never were they of any importance. As such, he thought to attempt something he figured could work in this reality as well. "We might be able to cut ahead by right of being Adventurers. Those people in Eonis acknowledged us as Adventurers, so it seems to be linked pretty hard to how the game works that way. I think it's worth a shot," he said while moving ahead of the others hoping to enter Dwargon. The looks he received as he passed person by person were not all too friendly, but Kou did his best to ignore them. After all, he was more bothered by the expressions on the tavern-goers before he spent the night in Eonis with Miki. Soon, he was upon the front gate, beside the line and in front of the guards. "Hold there! Back in line!" one guard said with a spear aimed at Kou's face. "Whoa, easy! We're Adventurers. Is there any way we can gain entry by agreeing to help out around town?" asked Kou, who had both hands in the air after the guard's rather threatening movement. Two guards exchanged glances with one another, with the most distant of the pair nodding to the other. "Adventurers, huh? Where's your passes?" asked the guard who remained in front of Kou. When asked this, the lad seemed surprised. He had no idea what an Adventurer's pass was, and there was certainly no such thing on his person. With that in mind, he looked toward Miki. "Err... any idea what he's talking about?" It seemed her possible explanation for why they couldn't ride into the city was accepted and this was enough for Miki. Strangely though, when she asked if they should join the line, after giving it some thought, Kou chose to cut it a bit and see if they could get in a bit early. Miki followed along, to avoid getting separated, but unlike Kou she met the uncomfortable gazes of the people she passed without flinching. 'The more people we encounter... the more it seems like they don't know they are NPCs... what if they don't know they are part of a game? I mean that is a bit 'Matrix-y' but their reactions are all a bit too real for it to be a UI thing...' Miki pondered the realness of this world quite a bit, mainly because she'd been human in her other world and knew of dangers, but the more they did with the people around them, the more she began to suspect something was amiss with the idea that they'd simply been teleported into the game. The long standing game mechanics not withstanding. Before she could continue to let her mind wander with her now soured expression, she found herself standing alongside Kou who now had a spear pointed at him as he tried to explain they were adventures. She turned her eyes towards this guard and shrugged gently. "Never heard of an Adventurer's Pass before... I wouldn't even know where to get one," the girl mentioned. She'd never thought of what it would mean to move around in a place that acted as its own world, perhaps they'd get to know soon enough what all this guard meant. Still, she remained still so as not to draw too much attention to herself and tried for serene in her facial expression. Miki had no clue what an Adventurer's Pass entailed either, leaving Kou to turn toward the guard again and shrug. "Gomen, gomen. No dice on the passes, but we're Adventurers, I swear!" he said while placing both hands on his hips and leaning his torso back slightly. The first of two guards didn't seem to appreciate these two claiming to be Adventurers without passes, but they clearly weren't in the know. "You can't call yourselves Adventurers if you aren't even in a Guild! Join a Guild and come back, or get in line like everyone else!" he demanded. At this moment, the other guard had a realization which led him to tap his companion. He was looking at these two with a twinkle in his eye, and nodded toward them just as they were being turned away. The same twinkle appeared in the more talkative guard's eye before he spoke again. "Wait... I guess we could use the help. We'll let you in this time, but I expect to see a Guild Card before you come back. Go on in," he said while shifting his spear away from Kou, clearing the way for the pair's entry. "A guild, huh? I guess that's worth looking into. Anyway, might as well get moving." With that said, Kou gave one final nod to Miki before moving on and into the city walls. The look on Miki's face shifted back to sour when it became obvious they were being turned away simply for not being part of a guild. Such a thing seemed a bit astounding to her, because the only guild function she remembered from the game was for partying up, perhaps such a thing had a different function now that they were within the game, much like the auction house had become the black market. She stared at the man who aimed to turn them away, only to have her eyes shift to the guard who tapped him on the shoulder. She took note of the twinkle in his eye, and the one which went to the eye of the other guard, as she mentioned a change in his stance on letting them in. Apparently he thought the kingdom could use them in some way, and beyond all that he claimed he'd let them through this time on the honor that they'd be part of a guild when they came back through. "Hai!" Miki said as she moved with him into the City walls. 'That's a really weird function for a game to try and force on two players... it's a really immersive and expansive game. It literally lets you choose most things, why would being pulled into it, change the functions of it in such a way?' the girl pondered. "Hm, so do we see what kind of help the Kingdom needs, or do we just go find a blacksmith and assume we will eventually be lead to the end goal because of how these things tend to work?" she asked of Kou. Still now that she was speaking she looked around the internal part of the city with wander in her eyes. "Sugoi! This place is huge in here. And everything is so well put together!" Kou moved into the city while glancing over his shoulder at the guards, seeming to be contemplating something quite heavily. 'Hmm...' Whatever he was thinking came to a halt when Miki spoke, bringing his attention to her immediately. When this happened, he was staring strangely at the girl for no apparent reason at all, and he answered with an unusual amount of nonchalance. "We came to the Dwarves because they're better blacksmiths than anyone else, normally. Any blacksmith who's the owner of his own shop should be able to refine Magic Crystals into Magisteel, and if they do that, there has to be a mine somewhere. If we find a smith, we find work. Find work that involves sending us to the mine, and we can collect the materials for our own stuff." Miki looked around this place until she got the sneaking suspicion that the lad with her was looking her direction. Her eyes cut to him and she confirmed this, before he answered her inquiry with an amount of nonchalance that was a tad shocking. "Sou ka, is that what you were thinking about, Kou? I only ask because you were looking at me pretty strangely for a second there..." she mentioned. She was obviously fine with doing the grind intensive work which would be mining in order for them to get the weapons they needed. That being said, finding a shop worth working with would be a bit intense. As she looked around just this corner, she saw at least three different blacksmiths buildings peppered around. Each with obvious different things they worked on, but still it was rather surprising to see so many in such a small area. She was beginning to wonder if the dwarves didn't take their crafting a bit too seriously but she supposed they'd find out soon enough.